SendCloud Plus helps you to save time and process your orders more efficiently. SendCloud Plus is a great way to process orders more efficiently. It takes you through the orders one-by-one, allows you to process the order with or without scanner and automatically prints labels for you. It is also possible to set up shipping rules that makes sure you process order with less errors. We will help you to get started in just a few steps. How do you process orders? 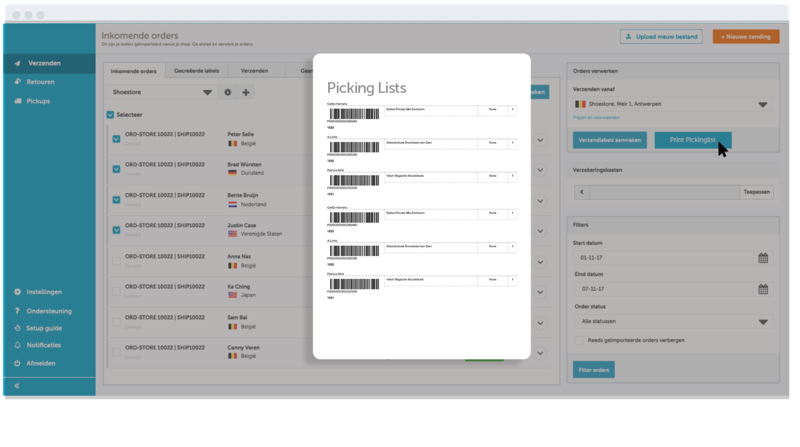 We developed Pack & Go, one of our new features which gives you two different options for processing orders. You can choose the option which fits best with your online store. It is based on picking & packing. If you make use of barcode scanners your best option is using our picking lists. In just one click you can print picking lists. A picking list is one document which is given to the warehouse clerks in order to prepare the products that an order contains. Pick your orders and scan de barcode on the picking lists, your shipping label immediately comes out of the printer. If you want to process your order one-by-one without using a scanner we recommend you to use this workflow. Via this way it is possible to create packing slips in one click. Someone in your warehouse can start packing up your shipments for example. It is possible to use Pack & Go with multiple workstations. How do you set-up and use shipping rules? Want to optimize your shipping process even more? Make use of shipping rules. This is also one of our new features which is included in SendCloud Plus. 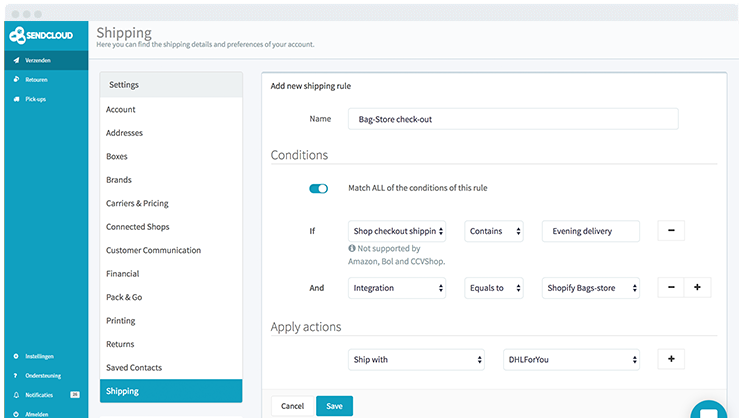 You can create rules in order to automatically select the best shipping options. 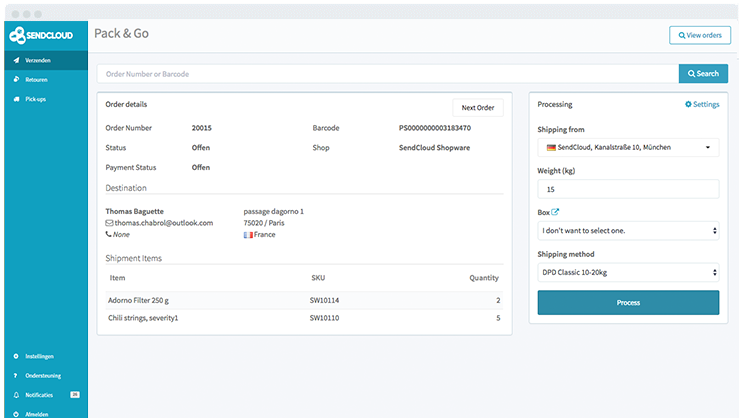 With Smart Shipping Rules processing orders can be based on weight, size, quantity, destination and check-out shipping method. For example "if package is 10 kg, choose DHL For You" as shipping method. What are the costs for SendCloud Plus? For the SendCloud Plus plan we will charge a monthly fee of €99,-. The plan includes Pack & Go (picking list & packing slips) and smart shipping rules. Your SendCloud Plus plan may start with a free trial. The free trial period of your plan lasts for 14 days, or as otherwise specified during sign-up. This will be invoiced separately from your regular invoice. You will receive an invoice at the beginning of the month. You can find SendCloud Plus as a separate part on your invoice. This subscription can be ended to whenever you feel like not using the SendCloud Plus features anymore. How do I cancel my plan? Go to your settings, subscriptions and choose de-activate SendCloud Plus.